Just as probiotics can bring a wide range of benefits to your health, they can also make produce safer, according to new UConn research on cantaloupes. This is good news, because the bumpy, net-like surface of a cantaloupe provides plenty of hiding places for bacteria to attach and weather the washing and disinfection steps in processing, allowing safe passage for pathogens to consumers’ plates. This corrugated surface is likely the reason why cantaloupes have frequently hit the headlines in the past 10 to 15 years as the source of foodborne illness, says Professor Kumar Venkitanarayanan, a food safety specialist in the College of Agriculture, Health, and Natural Resources, who has been researching ways to improve the microbial safety of cantaloupes. Chlorine is used as an industry standard for disinfecting fresh fruits and vegetables to improve safety and shelf-life of the food, says Venkitanarayanan. Chlorine is effective, but not 100 percent effective, especially in the case of cantaloupes. 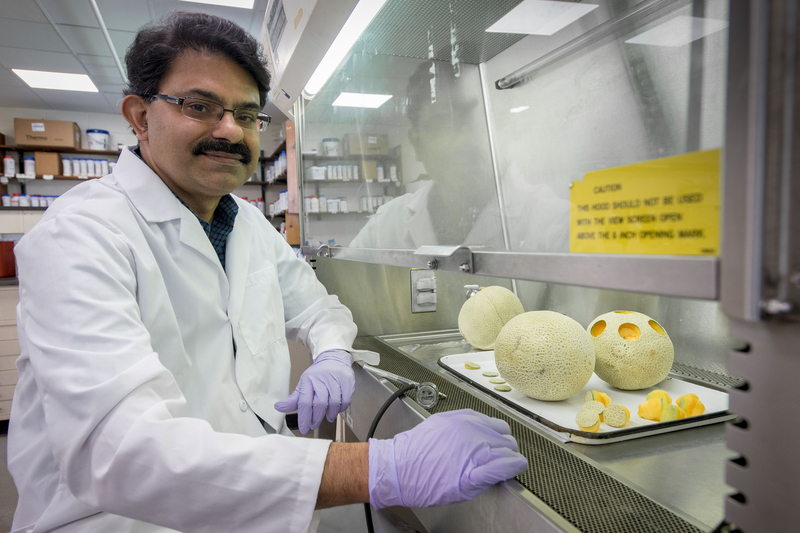 In an earlier study on the efficacy of different chemical disinfectants for the tricky-to-clean cantaloupe, Venkitanarayanan and his team of researchers came across something surprising. The experiments involved washing one group of cantaloupes with chlorine, and omitting the chlorine wash on another, then inoculating both groups with typical foodborne illness-causing bacteria, such as Salmonella or Listeria. 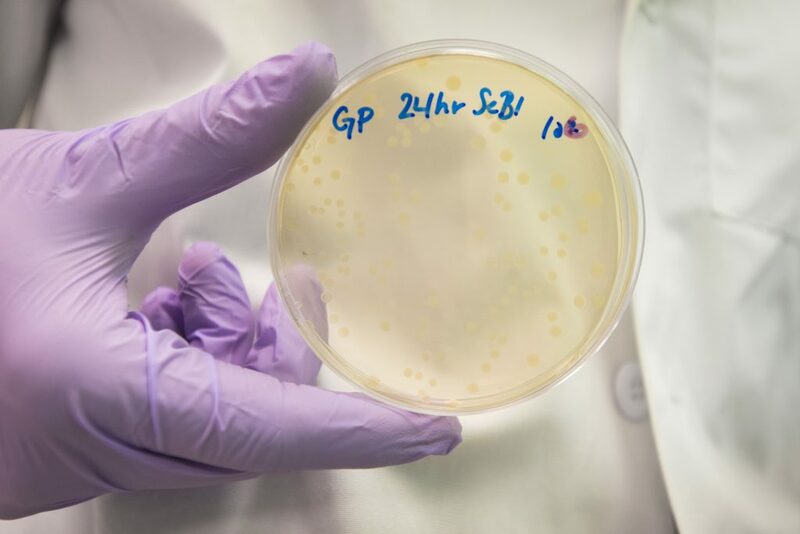 Surprisingly, the results showed the pathogenic bacteria were more persistent on the surfaces of the cantaloupes that were treated with chlorine. “Chlorine was not only not very effective at removing the pathogens, but maybe it removed the normal beneficial bacterial flora, the probiotics,” says Venkitanarayanan. Probiotics that may be keeping pathogenic bacteria from establishing themselves on the fruit. Probiotics are used widely these days in hopes of improving various aspects of health, from digestion to depression, but they are also used in the prevention of plant disease and for improving soil health, and Venkitanarayanan says he became interested in applying these principles to food safety. He and his research team set out to look at probiotics that have been used effectively as biosanitizers for the control of plant and soil pathogens. Settling on five to eight types of bacteria, they tested the abilities of these probiotics to prevent the growth of pathogenic bacteria on circular rinds of cantaloupe. The researchers then inoculated the rinds with either the pathogen, the probiotics, or both. 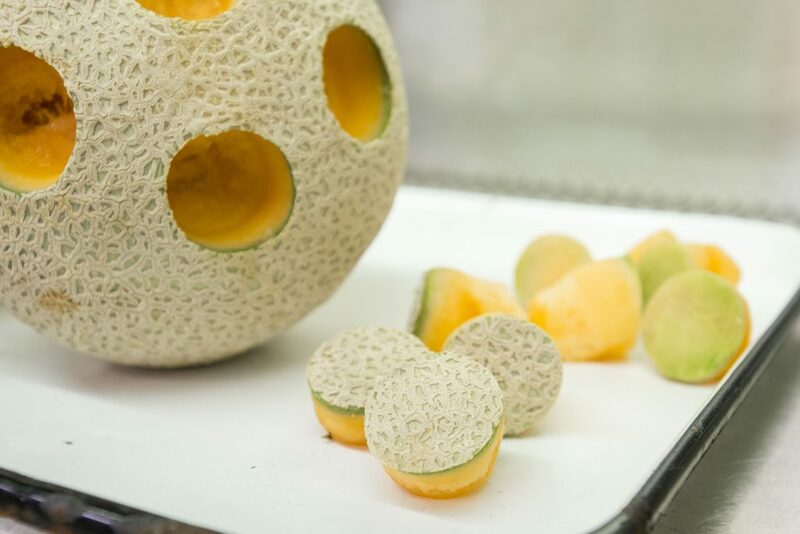 They simulated what would happen to the cantaloupe in the environment, by keeping the rinds at room temperature, as they would be in the field or in a store’s produce section. And the probiotics surpassed chlorine’s efficacy in disinfecting the surface of the cantaloupe. In addition to the potential for avoiding the use of chemical disinfectants on produce, probiotics also bring environmental benefits. Although the study itself was small, he says the results are paving the way for further studies into probiotic applications for food safety. For example, he notes that many of these same probiotics help prevent biofilm formation. This is a concern because Listeria, a common foodborne illness-causing bacteria, can form biofilms in processing plants. Currently, the team are looking into different types of probiotics, experimenting with different mixes to find the most effective candidates for future studies. They are also looking at ways to ease the process of applying the probiotics. Probiotic sprays for produce are not yet available for use at home, but to learn about other food safety practices you can implement now, visit the UConn College of Agriculture, Health, and Natural Resources’ Food Safety website. This work was funded by USDA-NIFA grant # 2015-05729.